Basal cell carcinoma is a form of cancer that affects the mitotically active stem cells in the stratum basale of the epidermis. It is the most common of all cancers that occur in the United States and is frequently found on the head, neck, arms, and back, which are areas that are most susceptible to long-term sun exposure. Although UV rays are the main culprit, exposure to other agents, such as radiation and arsenic, can also lead to this type of cancer. Wounds on the skin due to open sores, tattoos, burns, etc. may be predisposing factors as well. 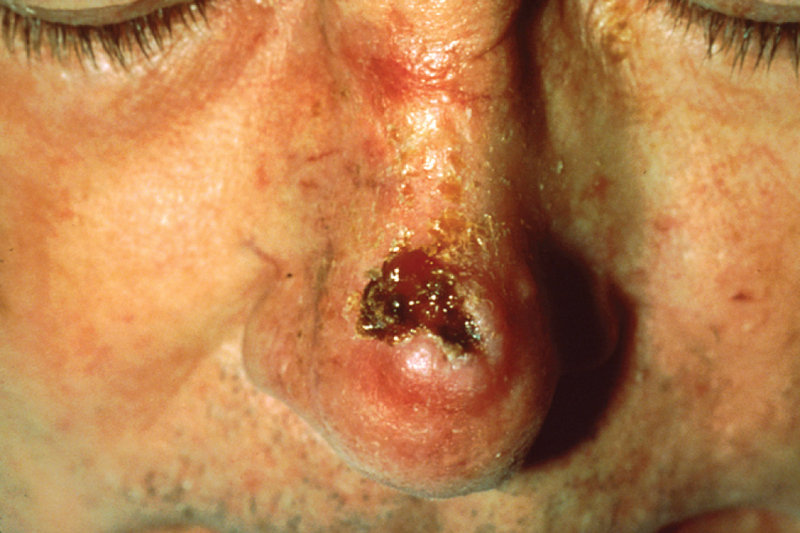 Basal cell carcinomas start in the stratum basale and usually spread along this boundary. At some point, they begin to grow toward the surface and become an uneven patch, bump, growth, or scar on the skin surface ([link]). Like most cancers, basal cell carcinomas respond best to treatment when caught early. Treatment options include surgery, freezing (cryosurgery), and topical ointments (Mayo Clinic 2012). Squamous cell carcinoma is a cancer that affects the keratinocytes of the stratum spinosum and presents as lesions commonly found on the scalp, ears, and hands ([link]). It is the second most common skin cancer. The American Cancer Society reports that two of 10 skin cancers are squamous cell carcinomas, and it is more aggressive than basal cell carcinoma. If not removed, these carcinomas can metastasize. Surgery and radiation are used to cure squamous cell carcinoma. A melanoma is a cancer characterized by the uncontrolled growth of melanocytes, the pigment-producing cells in the epidermis. 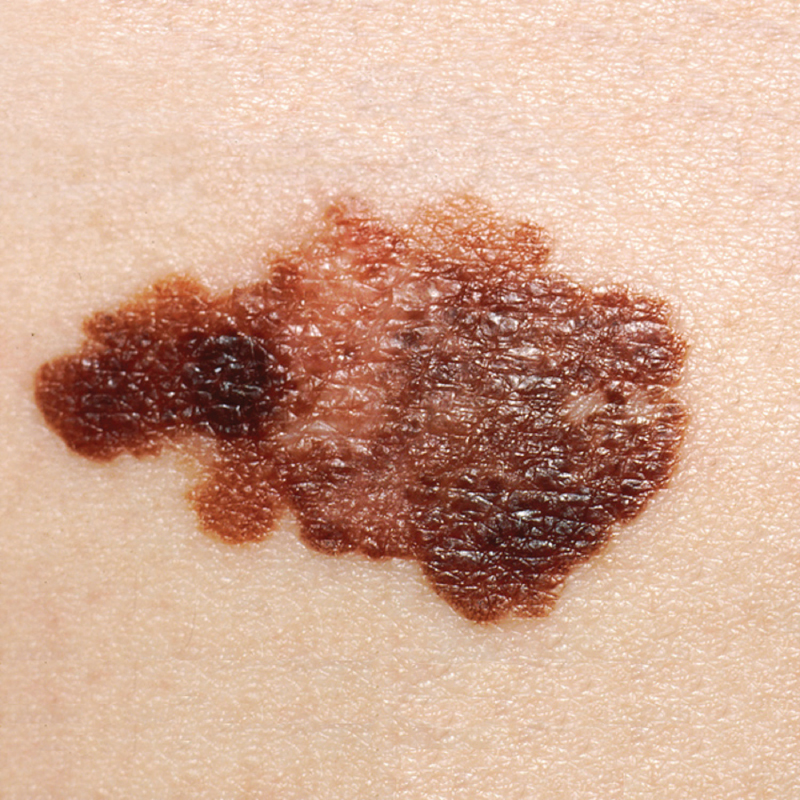 Typically, a melanoma develops from a mole. It is the most fatal of all skin cancers, as it is highly metastatic and can be difficult to detect before it has spread to other organs. Melanomas usually appear as asymmetrical brown and black patches with uneven borders and a raised surface ([link]). Treatment typically involves surgical excision and immunotherapy. Eczema is an allergic reaction that manifests as dry, itchy patches of skin that resemble rashes ([link]). It may be accompanied by swelling of the skin, flaking, and in severe cases, bleeding. Many who suffer from eczema have antibodies against dust mites in their blood, but the link between eczema and allergy to dust mites has not been proven. Symptoms are usually managed with moisturizers, corticosteroid creams, and immunosuppressants. Acne is a skin disturbance that typically occurs on areas of the skin that are rich in sebaceous glands (face and back). It is most common along with the onset of puberty due to associated hormonal changes, but can also occur in infants and continue into adulthood. Hormones, such as androgens, stimulate the release of sebum. An overproduction and accumulation of sebum along with keratin can block hair follicles. This plug is initially white. The sebum, when oxidized by exposure to air, turns black. 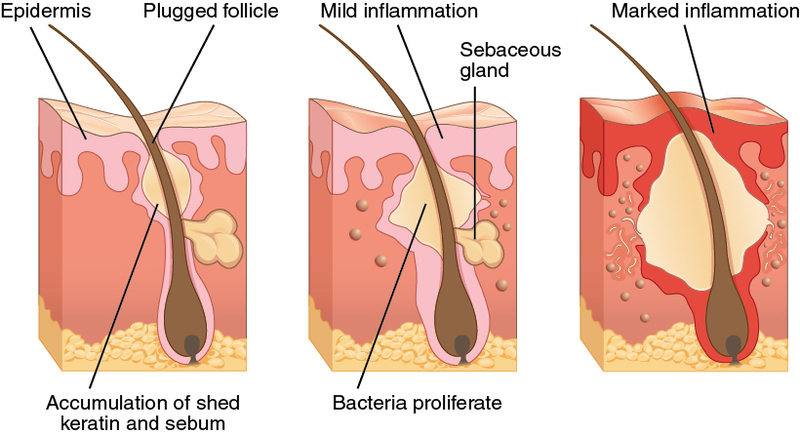 Acne results from infection by acne-causing bacteria (Propionibacterium and Staphylococcus), which can lead to redness and potential scarring due to the natural wound healing process ([link]). Burns are sometimes measured in terms of the size of the total surface area affected. This is referred to as the “rule of nines,” which associates specific anatomical areas with a percentage that is a factor of nine ([link]). Burns are also classified by the degree of their severity. A first-degree burn is a superficial burn that affects only the epidermis. Although the skin may be painful and swollen, these burns typically heal on their own within a few days. Mild sunburn fits into the category of a first-degree burn. A second-degree burn goes deeper and affects both the epidermis and a portion of the dermis. These burns result in swelling and a painful blistering of the skin. It is important to keep the burn site clean and sterile to prevent infection. If this is done, the burn will heal within several weeks. A third-degree burn fully extends into the epidermis and dermis, destroying the tissue and affecting the nerve endings and sensory function. These are serious burns that may appear white, red, or black; they require medical attention and will heal slowly without it. A fourth-degree burn is even more severe, affecting the underlying muscle and bone. Oddly, third and fourth-degree burns are usually not as painful because the nerve endings themselves are damaged. Full-thickness burns cannot be repaired by the body, because the local tissues used for repair are damaged and require excision (debridement), or amputation in severe cases, followed by grafting of the skin from an unaffected part of the body, or from skin grown in tissue culture for grafting purposes. The size of a burn will guide decisions made about the need for specialized treatment. Specific parts of the body are associated with a percentage of body area. Skin grafts are required when the damage from trauma or infection cannot be closed with sutures or staples. Watch this video to learn more about skin grafting procedures. In general, skin cancers ________. An individual has spent too much time sun bathing. Not only is his skin painful to touch, but small blisters have appeared in the affected area. This indicates that he has damaged which layers of his skin? After a skin injury, the body initiates a wound-healing response. The first step of this response is the formation of a blood clot to stop bleeding. Which of the following would be the next response? 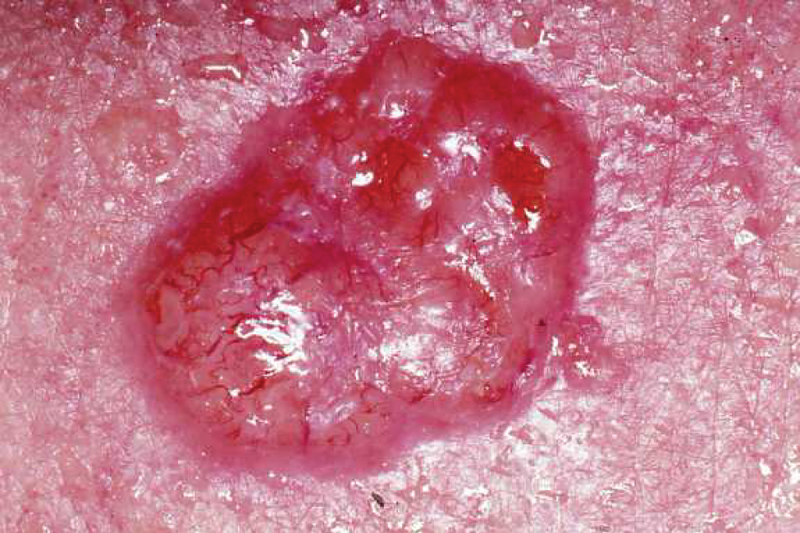 Squamous cell carcinomas are the second most common of the skin cancers and are capable of metastasizing if not treated. This cancer affects which cells? Why do teenagers often experience acne? Acne results from a blockage of sebaceous glands by sebum. The blockage causes blackheads to form, which are susceptible to infection. The infected tissue then becomes red and inflamed. Teenagers experience this at high rates because the sebaceous glands become active during puberty. Hormones that are especially active during puberty stimulate the release of sebum, leading in many cases to blockages. Why do scars look different from surrounding skin? Scars are made of collagen and do not have the cellular structure of normal skin. The tissue is fibrous and does not allow for the regeneration of accessory structures, such as hair follicles, and sweat or sebaceous glands. 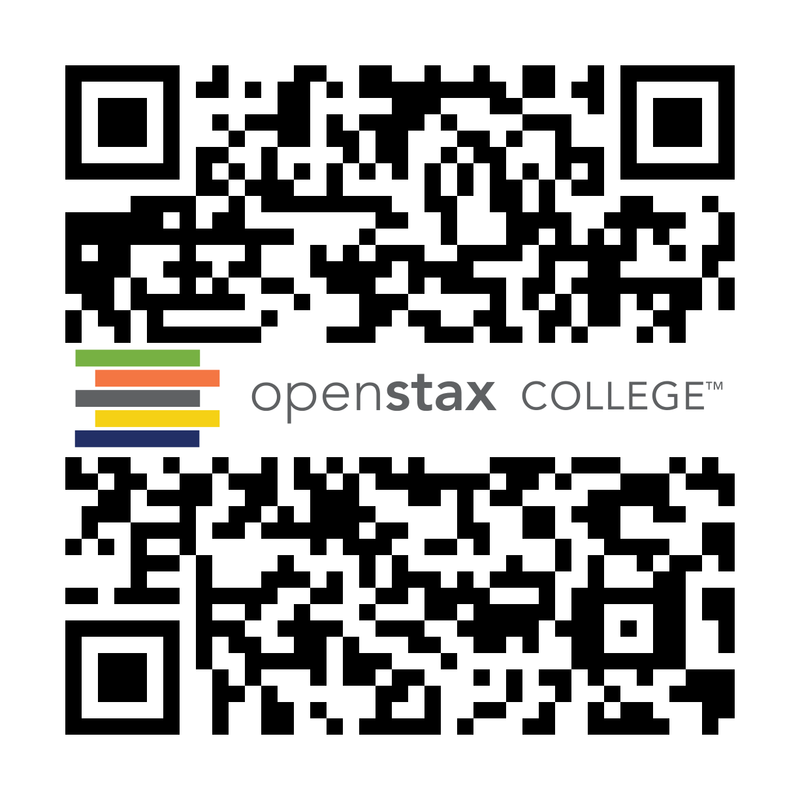 Diseases, Disorders, and Injuries of the Integumentary System by OpenStaxCollege is licensed under a Creative Commons Attribution 4.0 International License, except where otherwise noted.